In the past two decades, Vermont's wine business has grown from a hobbyist fringe ferment to more than a dozen commercial wineries. Most industry folks credit the development to new hybrid grapes — the vast majority released in the past 20 years — that marry the cold-hardiness of North American wild grapes with the more wine-friendly characteristics of traditional European cultivars. While the new grapes show decent winemaking potential, they remain unproven, just as the industry is young and the winemakers inexperienced. Despite recent growth, wine in Vermont is widely regarded as a brave new world, still in its experimental phase. But a different picture emerges from Wines of Vermont: A History of Pioneer Fermentation, out this week from Arcadia Publishing. In the book, local oenophile and wine blogger Todd Trzaskos traces Vermont vintages back more than a century. "People have been wanting to grow wine in this area since Jacques Cartier and Samuel de Champlain showed up [in the 1500s and 1600s]," Trzaskos says. "In the 1800s, people were growing all kinds of grapes and identifying cultivars that had promise." As an avid hobby vintner and member of the Vermont Grape & Wine Council and Adirondack Coast Wine Association, the author has followed industry developments on vtwinemedia.com for years. 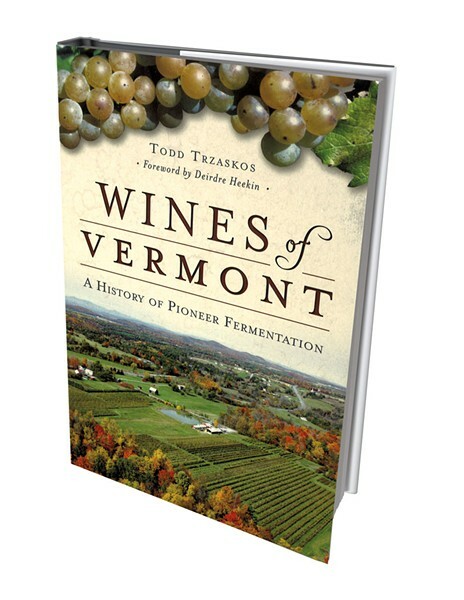 But when he started researching the book, Trzaskos says, he was surprised to find "a long cultural impetus that made people think that [Vermont] could be interesting [as a winemaking region]." The author will sell and sign books at Lincoln Peak Vineyard's Harvest Party this Sunday, September 20; and at Shelburne Vineyard on Monday, September 21. The book is currently available from online retailers, and will be stocked at several local wine shops and winery tasting rooms in weeks to come. The original print version of this article was headlined "Drunk History"